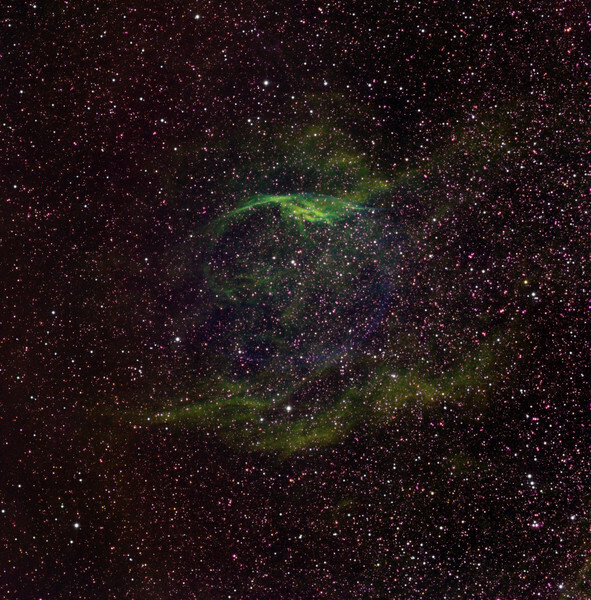 RCW 104, a Wolf Rayet nebula in Norma. Very faint (mag 18). Green: H-alpha 5hrs unbinned; Blue: OIII 4hrs 2x2, Red: SII 4hrs 2x2. There are only the faintest traces of III and SII in this image. It has taken much differential stretching to bring them out. This suggests that very little material has as yet been dredged up from deeper within the WR star. Notice the faint blue ring of OIII, comprising multiple superimposed shock fronts, is much smaller than the bright H-alpha, itself reminiscent of a giant clam shell. Aspen CG16M on 20" PlaneWave.